Helen Otterson’s sculptures combine divergent materials and imagery. Published on Tuesday, January 10, 2017. This article appears in the December/January 2017 issue of American Craft Magazine. 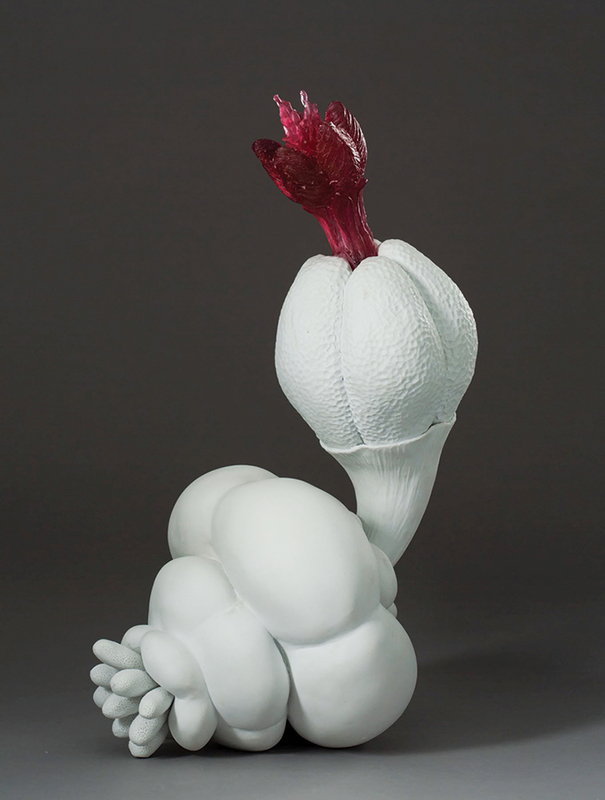 Bulb to Blossom, 2014, Hungarian porcelain, glass, 10 x 5 x 9 in. It can be hard to separate an artist from her work. Sometimes who she is and what she makes are so intertwined, so reflective of each other, that one can speak for the other. And sometimes the ideas that an artist explores in her work are so universal, they might speak for us all. That’s true of Helen Otterson, whose intoxicating sculptures of porcelain, glass, and bronze explore the power of adaptation and perseverance – recurrent themes in the artist’s life that almost everyone can identify with. Otterson’s lush, seductively rotund forms are both foreign and familiar, a garden of succulents evocative of other biological forms that are, at first, difficult to place. They appear to be plants, yet something is amiss. And our instincts are correct: In her recent works, Otterson, 45, blends not only distinct materials, but also divergent imagery, merging botanical forms with cancer cells. At a microscopic level, the two look a lot alike, she points out. But she also sees a common thread in how succulents in drought and bodies besieged by cancer both manage to survive. Acting on this lesson has helped Otterson navigate a career that has taken her across the country and abroad. She earned her BFA at Kansas City Art Institute and her MFA at the University of Miami, moving on to residencies, workshops, and teaching gigs at various schools and universities. 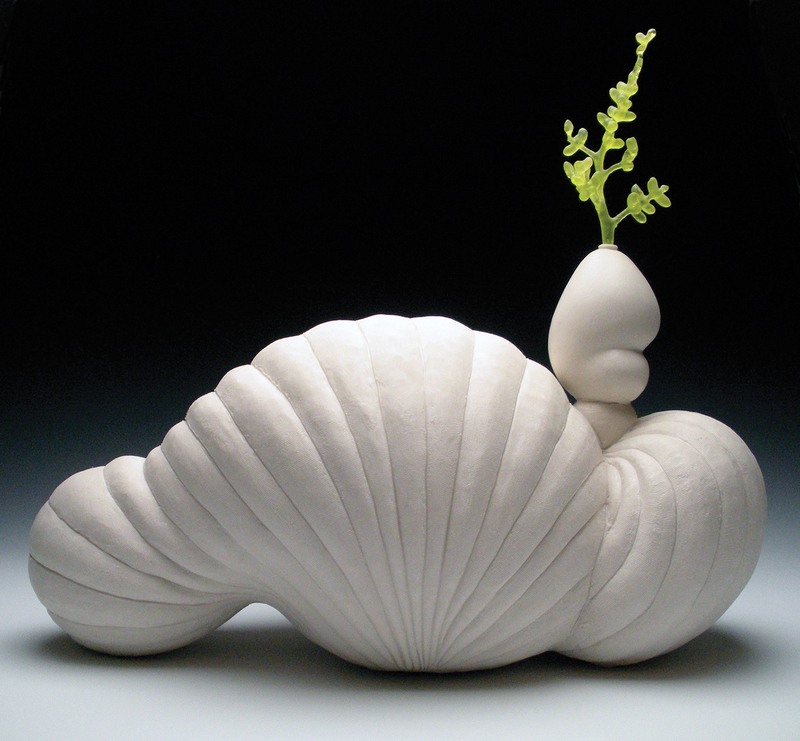 She has also had fruitful collaborations on both functional and sculptural work. “She’s a professional wanderer,” observes Michael J. Strand, her former collaborator and colleague at North Dakota State University. “She can move seamlessly in and out of any situation in such a fantastic way.” Her success lies not only in her ability to adapt to different living and working situations, different climates and cultures, but also in her embrace of different materials; she understands when to use clay, when to add glass, and when bronze is just the right structural element. Like many teachers without tenure, Otterson has found that what she lacks in security she makes up for in flexibility. After four years of teaching college in North Dakota, this past summer Otterson completed a residency at the Zentrum für Keramik in Berlin, taught a workshop about merging clay and cast glass at the Grand Marais Art Colony, and was a McKnight resident at Northern Clay Center (both in Minnesota). Most recently, she moved to Kentucky to be an assistant professor of sculpture at Morehead State University. It may seem like a lot to pack into a year, but the artist embraces travel. “It really makes you realize that people are different,” Otterson reflects, and “how we’re similar.” One similarity, as both her work and life illustrate, is the need to adapt – and, ultimately, to persevere. Kecskemét Viràgzàs, 2016, Hungarian porcelain, glass, 17 x 8 x 9 in. Lepidoptera, 2012, porcelain, glass, 16 x 18 x 8 in. 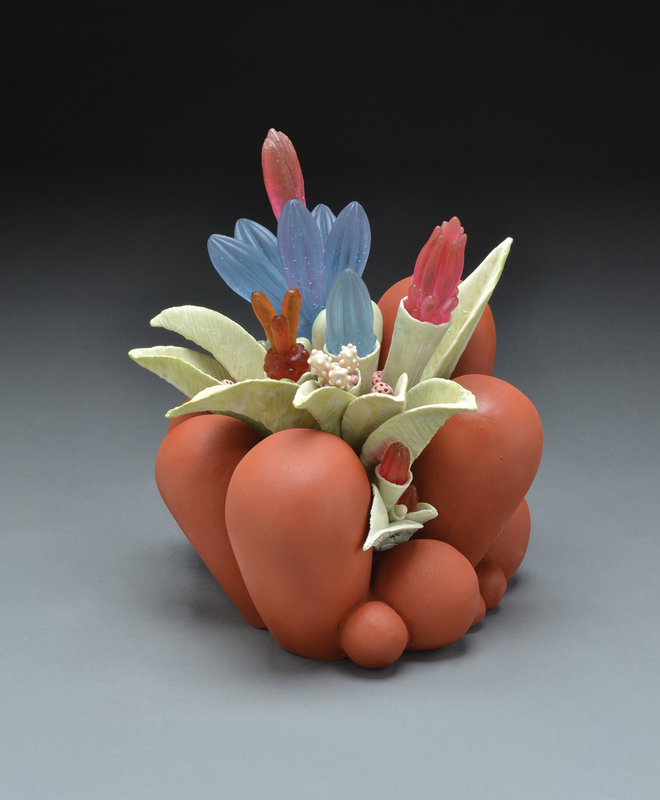 Floral Burst, 2011, terra-cotta, stoneware, glass, 12 x 13 x 14 in. 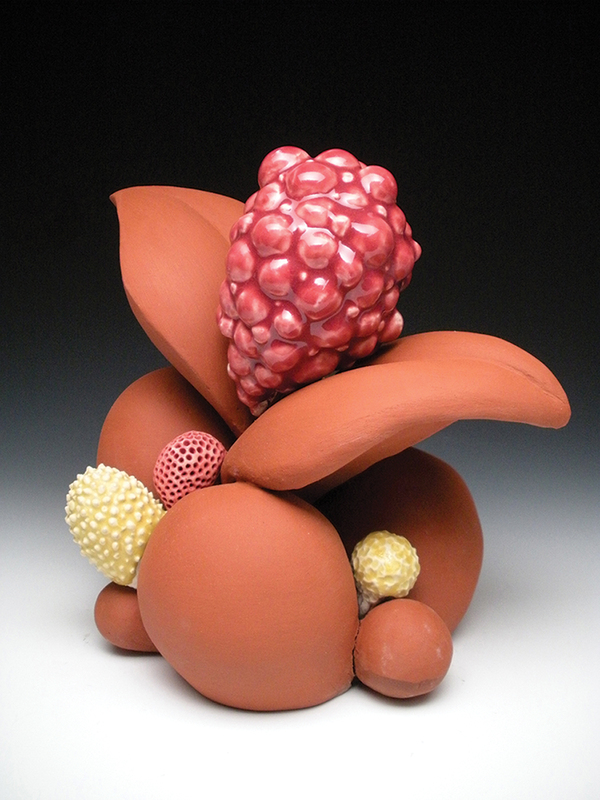 Ruby Blossom, 2014, ceramic, bronze, glass, 19 x 8 x 8 in. 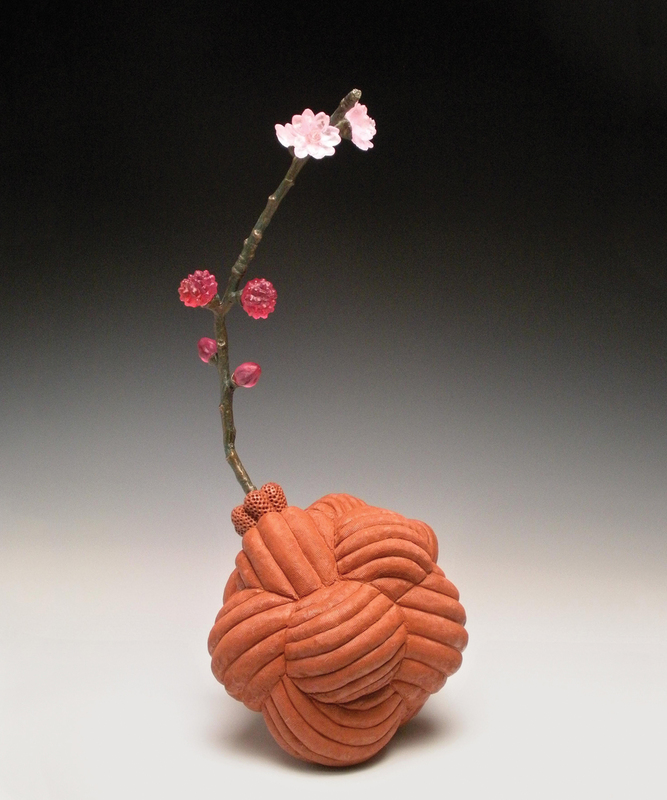 Balance, 2008, terra-cotta, stoneware, 10 x 8 x 8 in.